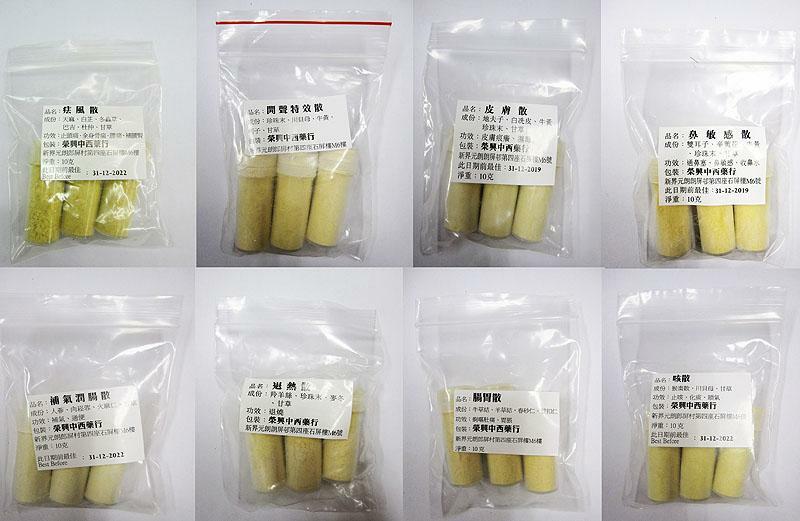 The Department of Health (DH) today (January 25) urged clients who consulted a registered Chinese medicine practitioner (CMP), Shek Shiu-wing, practising at "Wing Hing Medicine Co." located at Shop M6, Shek Ping House, Long Ping Estate, Yuen Long, not to consume eight types of powder (see photo) he prescribed as they contained undeclared Western drug ingredients. The DH announced on December 22, 2017 a case of undeclared Western drug ingredient detected in powder prescribed by the above CMP, involving a suspected poisoning case of acute liver failure of a 64 year-old female. The patient concerned was discharged from hospital after treatment. During DH’s investigations, nine types of powder were seized at the above premises. Testing results from the Government Laboratory revealed that samples of eight types of powder were found to contain undeclared Western drug ingredients, namely paracetamol, diprophylline, chlorpheniramine, picosulfate, simeticone and dequalinium (details of the results are listed in the attachment). Testing on one type of powder (no English name) is still ongoing. "Paracetamol is commonly used for its anti-pyretic and analgesic effects. Overdose may cause liver and kidney damage. Diprophylline is used to treat asthma. It can cause irregular heart rate, gastrointestinal discomfort and nausea. Chlorpheniramine is commonly used for the treatment of allergic reaction, and its side effects include blurred vision and drowsiness. Picosulfate is used for treatment of constipation. Its side effects include colic or cramps. Simeticone is used for the relief of flatulence and abdominal discomfort, whereas dequalinium is used in the treatment of minor infections of the mouth and throat," the spokesman explained. In addition, a quantity of controlled Western medicines, including Part 1 poisons namely, indomethacin and prednisone; and antibiotic, namely amoxycillin, were also seized in the premises concerned during the DH’s operation. Indomethacin is a non-steroidal anti-inflammatory drug used to relieve pain and inflammation. Its known side-effects include gastrointestinal discomfort, nausea, peptic ulcer and renal impairment. Prednisone is a corticosteroid to be used under medical advice. Inappropriate use of corticosteroids may cause serious side-effects such as Cushing's syndrome, with symptoms including moon face and muscle atrophy. Amoxycillin is used for the treatment of bacterial infections. It can cause hypersensitivity reactions. Upon completion of investigations, the DH will seek advice from the Department of Justice regarding prosecution against the above CMP for possible contravention of the Pharmacy and Poisons Ordinance (Cap 138) for illegal possession of Part I poisons, manufacturing and possession of unregistered pharmaceutical products and the Antibiotics Ordinance (Cap 137) for illegal possession of antibiotics. The maximum penalty for each offence in the former is a fine of $100,000 and two years' imprisonment while that for the latter is a fine of $30,000 and one year's imprisonment. The DH has referred the case to the Chinese Medicine Council of Hong Kong for consideration of possible disciplinary action. Members of the public are reminded again to stop using the abovementioned powder. Those who have consumed powder and feel unwell should consult health-care professionals as soon as possible. People should submit the related powder to the DH's Chinese Medicine Division at 16/F, AIA Kowloon Tower, Landmark East, 100 How Ming Street, Kwun Tong, Kowloon, during office hours for disposal.